I wrote my memoir, Betrayal of the Spirit, because I felt an obligation to expose what I had witnessed. From 1978 to 1988 I was a devotee at the Los Angeles headquarters of the International Society for Krishna Consciousness, ISKCON. Ultimately, I was one of many people who left disillusioned as the organization devolved into a mire of unethical behavior. During my years in the group, I worked in the nexus of power, covering up scandals for the leadership. I moved into the Los Angeles ISKCON community June 19, 1978, the day after my graduation from the University of California, Santa Barbara (UCSB). For 10 years, I was a fully committed member, living and working inside the organization. My disillusionment started in 1986 and grew worse in 1987. I got the idea to write a book in 1987, so I signed up for writing classes through the UCLA Extension Writers' Program. By the time I moved away from the ISKCON community in 1988, I had a 500-page first draft but did not finish it. In 1993, I picked it up again and completed it, and in 1997 my book was published by the University of Illinois Press. The writing process had two distinct stages. From 1987 to 1990, I poured out my memories and struggled to make sense of the experience on paper. The second phase, from 1993 until I turned in the completed manuscript, was more of an intellectual exercise as I edited the book for publication. This essay will focus on the earlier phase since that was the real therapy. During the early writing and healing process, I never had writer's block. It was the opposite. Writing was an obsession that possessed me for 5 or 6 hours nearly every day. When I finally set the work aside in 1990 and stopped working on it, I experienced not writer's block, but a feeling of completion. Something inside clicked so I could release the experience to focus on what was happening in my life: graduate school, work, new friends, and my new life in Oregon. An old friend reminded me recently of the joy I had expressed when I first decided to write the book. The prospect of telling what I knew let me release all the stress from years of working for the ISKCON leaders. They had told me that the criminal element of the group was an aberration, like a bad apple in a barrel; but the problems were systemic. When I started my book, I thought I understood all of ISKCON's secrets. Every time we issued a press release disavowing connections with members who dealt drugs, kidnapped, or killed, I knew it was a lie. I had known for years that the department I worked in ran on drug money. So up to a certain point, I was a willing participant. As it turned out, I knew only a fraction of the group's secrets. Later, in my research, I learned about the child abuse and other crimes. If I had known earlier, I might have postponed any plans to write the book. For one thing, I would have recognized the danger. After the book came out, I learned that all the people in the know had been reluctant to speak out for fear of retaliation from the dishonest leaders. With little to no idea of what I was up against, I wrote my book to heal myself. I believed that revealing the secrets I knew would relieve the pressure I felt, and also help bring the organization into line. I was naïve and had grandiose delusions about what my writing could do to reform ISKCON. I was on a mission from God, as John Belushi and Dan Ackroyd famously proclaimed in the movie Blues Brothers. I was out to clear Krishna's good name, as well as my own. I still feel sadness that an organization bearing Krishna's name was associated with child molesters, murderers, and drug dealers. My 500-page first draft did not cite any references. It included few names, dates, or other specifics, except for the basic characters who played a part in my story. I did not plan to do much research for the book. I knew what I was talking about, which was all that really mattered. I liked it. In 1990, a big New York agent responded to my inquiry letter, requested the manuscript, and gave me a long list of suggestions to make it publishable. Then I paid an editor to read it, and she gave me an even longer list. I knew the path would be difficult, with no promise of success at the end. But that was only one reason I put the manuscript aside in 1990. Looking back, I see that I had said what I needed to say to settle the issues within myself. And I had my creation: 125,000 of my own words printed on a ream of paper, a treasure that fit neatly at the back of a drawer as proof of the odyssey I had been through. That was enough. I thought I might publish it someday, but for a time I wanted to let my wounds heal. While I was constructing my first draft, the teachers and other students at UCLA were supportive of my writing goals. The classroom was the only real support system I had at the time, but it was all I needed. I took several classes from my first teacher, Laura Olsher, a retired actress and television writer who had worked on Days of Our Lives in the 1960s. I could see how satisfying that work was for her, and I realized my experiences had as many twists and turns as any TV soap opera. And my story was not just based on truth; it was true. The first class I took from Laura Olsher was Autobiography Into Fiction. She taught us to write scenes and dialogue, as though we were writing a script. When I sat at the computer to record my memories, I focused on key turning points in my own personal drama. At first I wrote in third person, giving myself and everyone else fictitious names. This anonymity, first as Shawni, then Lori, freed me to write whatever I wanted and helped loosen stuck memories. I worked toward a realistic portrayal of what I had witnessed. I credit my inspiration for all of that to Laura Olsher. She taught me to write to bring readers along to see things for themselves, instead of just telling them. Writing was the best therapy I could have received. It played a part in my decision to leave ISKCON, sustained me through the process of leaving, and delivered me into the state of actually having left. When I sat at my computer or poured over printouts of the manuscript, I was in control. I felt good reenacting the key scenes of my story in a way that showed not only what happened, but how I experienced the events. I was the lead reporter and interpreter of the story, so the process gave me a feeling of complete freedom. Obviously, writing 500 pages took many hours and produced a lot of random material to organize. My father was dying of cancer and wanted my husband and me to stay with him; that was how we moved away from the temple. My dad had encouraged me to write the book, and he cleared an area at the foot of the stairs where I could work. Sadly, he died January 3, 1989, just a week after we moved in. My life was a constant state of upheaval from the time we started to move until after he died. When I finally sat down at the computer, I spent most of the next 6 months organizing what I had written. I realized the dozens of pages of scenes from my childhood and adolescence that made me vulnerable to joining the cult, and the multiple scenes to describe my senior year of college at UCSB, where I had met devotees, made the beginning drag and would have made the material difficult for a reader to get into. Worse, I could find no place for the scenes later in the book, either as flashbacks or as a whole chapter to explain why I joined. I later realized that the mental energy I spent contemplating how to fit these pre-ISKCON scenes in was really a contemplation of who I was separate from ISKCON, and how the real me fit into the cult experience. The ISKON gurus wanted us to erase any non-ISKCON parts of ourselves. They preached that we were dogs before we met them. I was 22 when I met my guru and was initiated. As a compliant and emotionally needy young person, I obediently disowned more than two decades of memories and threw away all my poems, journals, photos, paintings, clothing, music, college work and textbooks, and anything associated with my karmi (pre-ISKCON) life. Erasing my precult self took away both my inner strength and my ability to think rationally. My rational precult self could have asked: Is this guru telling me the truth? What are the risks of joining this group? Should I leave? Families who lose a child to a cult may feel as if the person has died. They may see a change in the loved one's behavior—a vacant stare, a frozen smile, and a tendency to repeat cult rhetoric instead of participate in a normal conversation. During my years in ISKCON, I wore that empty stare and fake smile, and I did repeat cult rhetoric. One of my letters home, just a compilation of Bhagavad Gita verses, made my mother break down in tears. She tried to reach out to me, but I must have appeared to her as a shell of my normal self. Writing key scenes from my pre-ISKCON life helped me reconnect with my precult self and was therefore a major part of the therapeutic process. First I traced out the vulnerabilities I saw in myself, including the most painful memories from my childhood and adolescence. Although I initially wrote enough to fill a book, I cut most of it from the final draft. Still, these were the most important memories to write. Doing so did not make my younger life any better, but it made me feel more like myself again. Early on, an advisor told me he could see a trajectory in my story: I joined ISKCON because I needed what they had to offer—a spiritual path, discipline, a surrogate family, and a connection with god. My progress was in a positive direction. However, just around the time I joined, ISKCON had started on a downward spiral. The founder, Srila Prabhupada, had just died in India, and unqualified men took over the organization and had started to destroy it. So I was going up while ISKCON was going down. Then in 1986, ISKCON's problems started to drag me down. Eventually I realized that I had to leave. This tension created a complex story arc, which I kept in mind whenever I worked on the manuscript. Understanding myself through writing about my life apart from ISKCON laid the foundation for my healing. Then, writing the story, I could see how the organization's problems affected me. This new perspective allowed me to retrace what I had been through and feel more confident about my decision to leave. This perspective has continued to deepen. Another healing element was my working title. The subtitle, My Life behind the Headlines of the Hare Krishna Movement, came later, just before the book went to press. However, the words betrayal of the spirit came in 1989, just weeks after my father died. I was living in his house in Los Angeles, helping his attorneys tie up the last details of his life. I had a few classes at UCLA and a series of sessions with a writing coach, Kenneth Atchity. 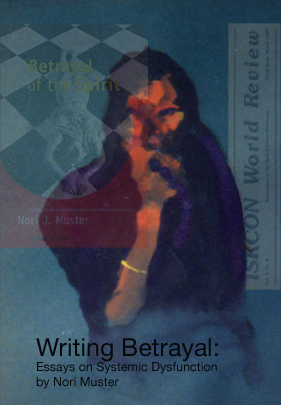 The title, Betrayal of the Spirit, came from our brainstorming, and I edited the book to the title, not even fully understanding what it meant at first. It just seemed right. After that, everything revolved around the title, like ribbons around a Maypole. Many times, at different stages of the writing process, I had to stop and think about the meaning. How was spirit betrayed? Who did the betraying? Certainly, the main culprits were the leaders who exploited naïve followers like me; but it took tremendous courage to admit my own part in the betrayal. I was there, I took part in it, and I was as guilty as any low-level operative in any conspiracy. Admitting my own participation was a deep cleansing. Without that, I would still be harboring guilt, and the pollution would be eating me away on the inside. I fully realized I had given away 10 years of my life in the service of cult leaders and worked on that every time I worked on the manuscript. In writing the book, I processed my memories to make them okay with me. In my opinion, the only totally innocent people are the children. They did not choose to join and were often unwilling participants. Adults who join cults and stay for years must take the consequences—not that former members should feel guilty about their decisions, but that they should at least acknowledge the pain they may have caused others. Old friends and family were probably hurt by our decisions; if we got somebody else to join, we were partially responsible. Anybody who did PR for a dangerous cult, as I did, certainly shares in the responsibility. Before the book went to press, I met some young men who had grown up in ISKCON when I was a member. They told me they were all abused in the ISKCON schools, and that they all hated the PR department. We had used their photos for our publications but never acknowledged their abuse, and they despised us for it. I was unaware of the systemwide abuse at the time, but it was important to find out. Could I live with myself without doing something to reverse the damage I had done? Maybe I could have forgotten about it after a while, but the guilt would have stayed under my skin. I can forgive drug dealing, hypocrisy, and the harm ISKCON did to me. However, I could not forgive the organization for hurting children. I felt that, since I had been a participant, I needed to address the issue. Again, writing was the best way to ameliorate my guilt. My book Child of the Cult is my atonement for whatever part I played in covering up the child abuse in ISKCON. I started writing it in 1998, and in 2012 it was published on Kindle. Friends thought I would give up on my second book, but completing it was the only way I could live with myself. The therapy was in the writing, in the research, and in the product. I wanted to work the issues out within myself, and then pass along what I had learned. Not everybody is as compulsive as I am. Friends have told me to lighten up, be grateful I got out, and just live my life. A counselor once asked me if it wouldn't just be easier to go on medication. She said it would lift my spirits and I would feel better. However, as a teenager I had been on medication for depression, and I did not want to go back to pharmaceuticals. She said the medications are better these days; but I walked out of ISKCON with a load of guilt, and I could not just medicate my feelings away. I had to chip them off of my soul bit by bit. Another advisor, John Hubner, coauthor of Monkey on a Stick, the other tell-all book about ISKCON, said, "I only want to read a book that's written in blood—and your book is written in blood." I take that as a high compliment that makes me feel better than any drug could. I believe words can balance brain chemicals, and that I am a case in point. Words healed my wounds at the root. The words that healed me did not even have to be published. I just needed to write them, then consider them, rewrite them, move them around, and consider them again. Bringing my story into the world had some unintended consequences that former members should think about if they consider publishing their stories: Publicly confronting the dishonesty I saw has tied to me to ISKCON as a critic. People find my book and contact me to answer their questions. Because of the book, I still have to think about that experience; and I continue to write essays and defend my books. Another consequence involves my career. Just when Betrayal of the Spirit came out in 1997, the Internet opened up. With a simple Internet search, any potential employer can find my background with ISKCON. Finding a good job is difficult enough, but having a cult memoir on one's resume may be the decisive factor that turns away a potential employer. If I could do one thing over in my life, it would be to have stayed at Humboldt State University in 1977. If I had not transferred to UCSB for my senior year, I might never have met devotees of or joined ISKCON. But if I had to join, I wish I had left sooner. There was a day in May of 1986 when I found myself typing up a press release about a murder that had taken place inside the organization. In the release, we claimed that the murderer and the victim were both former members, and that ISKCON was not responsible. I knew that was a lie. I wish I had told my boss, "I don't do press releases to cover up murders; sorry," and walked out. Failing that, I lost all respect for myself. I had to write my book. I had to salvage what was left of my personal integrity. So while I regret joining and remaining in ISKCON, I am proud of the book.